Presented buyers on the purchase of this fine property. Generous, light-filled home with good flow of space andincredible views. This fine property has agourmet kitchen with new appliances opening todining room and adjacent family room with sliding doors to the deck. Elegant bathrooms, new dual pane windows, refinished hardwood floors, new interior paint and carpet are among the many fine touches featured.A nicely restored staircase with skylight leads toa large size master bedroom with sweeping viewsand plenty of closet space.In addition, there is agood size backyard awaiting an urban gardener and cozy no-step-to entry access to property with good amount of parking space and lovely planters. Easy access to freeways, proximity to best of Oakland and San Francisco! We had a pleasure of representing the Buyer. Spacious delightful units with open floor plans, updated kitchens & bathrooms, and laundry in each unit. Separate entrances & access to good size back yard. A picturesque view, dual pane windows, garage, plenty of storage & easy access to freeways. Location, Location, Location! Highly desirable Grand Ave/Lakeshore area, walk to Trader Joes, Peets, Starbucks, shops and restaurants!. Lovely one bedroom units (2 remodeled), hardwood floors, high ceilings, sep. storage. Bldg. approved by DRE to sell indiv. Gracious, sophisticated light-filled interior w refinished wood flrs & built-ins in livingroom & formal diningroom. Renovated kitchen & bath with new tile floors & stainless steel appliances. Good size laundry room, garage w plenty of storage. Large flat back yard with spacious patio & rose beds. Walking distance to College & Claremont Ave, this charming two story building with good street presence offers hrdwd floors, good size units with plenty of light, back porches & detached garages. One bedroom units. Located at the end of cul-de-sac on a large lot, this is a hidden gemwith wooded creek-setting. This charming home in major need of work has circular multiple bay windows and attractive views of the surrounding hills. Locatedin the prestigious Lakeshore Highlands neighborhood off Trestle Glen. An excellent floor plan with large windows, view of the hills, and plenty of light, grace this elegant property. The large formal dining room blends the contemporary designer colors with leaded glass cabinetry. Exquisitely designed kitchen provides plenty of shelf space, pantry, and eat-in space. Stately fireplace, fabulous hardwood floors, soft pastel paint and large windows provide for beautiful atmosphere in elegantly arranged living room. This is a private and secluded location, yet close to cafes and farmers market of Lakeshore District, with easy access to freeways. Charming 40's Glenview Bungalow with fabulous chefs dream kitchen-2 convection ovens. Beautiful refinished hardwood floors, fireplace, tiled plus room with half bath, extra large garage, private garden w/storage barn. Just around the corner from popular Glenview shops and restaurants. 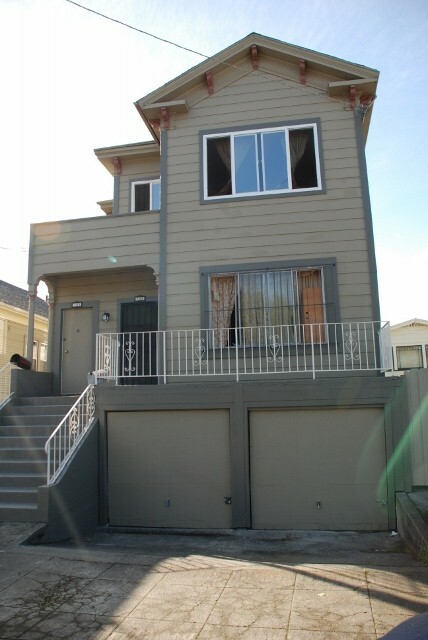 Short sale, large duplex close to Berkeley Bowl. Upper unit vacant with sun room and porch. Lower unit long terms tenant. Represented seller. Large property with plenty of light on a level lot with a pool. Wonderful opportunity to bring this fine home to its full potential. Represented buyer and seller. Maxwell park beauty. Represented buyer. Lovely home in a garden setting. End of cul-de-sac. Represented buyer. Ranch style home on a large lot. Represented buyer. A fine blend of classical style with personal touches throughout. Welcoming front porch with a formal staircase that leads to a well designed upper unit with bright and open kitchen that has a partial view of downtown Oakland. Cozy and comfortable lower unit. Fruit trees in the back yard. Proximity to freeways, downtown Oakland and Berkeley. This nicely updated residence in San Francisco features a new eat-in kitchen and nicely designed bathroom. Interior access from good size garage with storage. Plenty of light. A contemporary feel inthis bright two story townhousewith vaulted beam ceilings. A serene and welcoming entry via cozy courtyard lined with brown shingle exterior. Good flow of indoor-outdoor spacewith multiple decks and kitchen that opens to front porch. Separate study or office on the main level. 2 bedrooms and 2 bathrooms downstairs with large laundry room and plenty of storage. Two car detached garage. 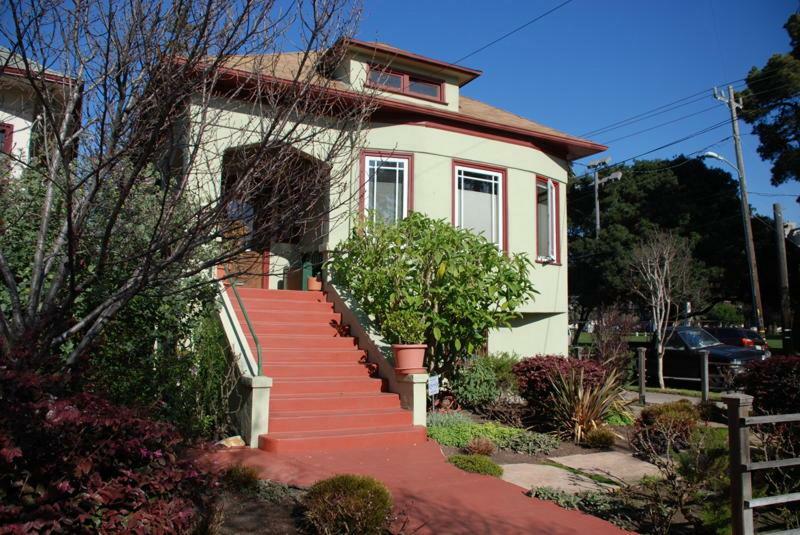 Fabulous San-Francisco-style flats with generous front porch and gleaming hardwood floors. Shakespeare-inspired tile on the fireplace in the lower unit. Many unique details and extras in this rare property. This charming light-filled home has a gourmet kitchen with open shelving, antique stove, dishwasher and pass through to a spacious dining room with original millwork/trim. Large master bedroom has "pocket bath" plus full bathroom in the main hallwaywith original claw tub and hand held shower fixture. 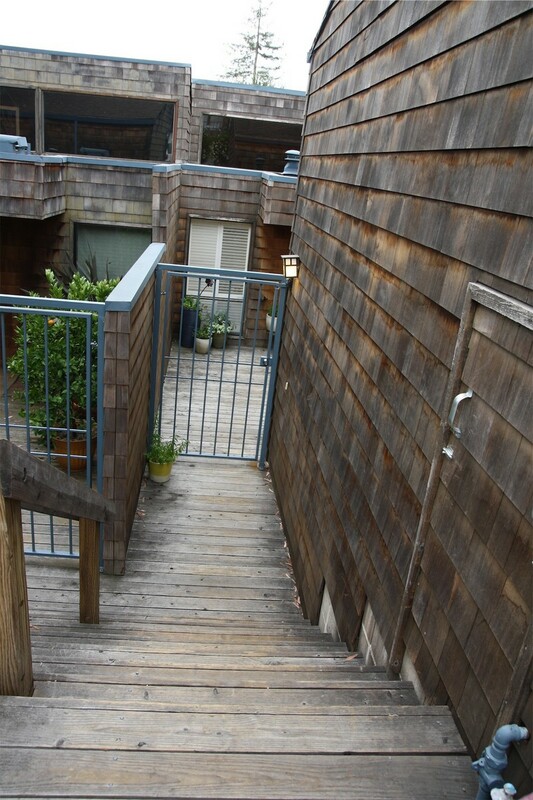 Each bedroom has lots of light and access to balcony leading to landscaped back yard with fruit trees. Hdwd floors, comfortable floorplan, two car carage.